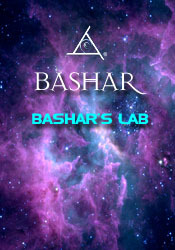 Experience Bashar's "cosmic classroom" and see how much fun it can be to learn about the things that really matter to you! Description of what will be studied during this class and how the universe is our playground. Bonus: An extensive exploration of which stars in our galaxy have life. Q&A: Prime Radiant. Illustration of the prime radiant with crystals. What are thoughts? How does one transform thoughts they don't like? Creation is intelligent. The infinite is greater than the finite; the finite is less than the infinite. The finite is contained in the infinite. Space Time Description of time dilation and its ramifications. Are there any humans who can travel at the "space of time?" How can the Merkaba be used to help us? Is 100% of space the same as infinity? Can we achieve Merkaba in this lifetime? Can we use the space-time generator to solve the energy crisis? Discussion of perception, how we are led by our assumptions, and the need to pay attention. Every change is a total change. How do our collective agreements affect the idea of the changes we wish to make and any limitations we place upon ourselves? Can the ground rules be changed when we have collective agreements? What if not everyone is in agreement with someone who wishes to changes the ground rules, such as Hitler? How can we avoid such an occurrence? Winning the lottery means bending your reality to your number, not the other way around. Time takes the concept of a static reality and expands it into the next dimension. Everyone perceives everything and every event differently. What you experience in your physical reality utterly depends upon your point of view. Discussion of the idea of experiencing one's reality as being obvious. There is no past or future. There is only now. You exist only now. Bashar plays with the audience with a variety of Brain Teasers The tonal vibration of Earth is slightly above the musical note C-sharp. Losing her temper with others and appearing unprofessional. Is this related to abuse of power in a past Mayan culture? Does it really matter what food we eat? From the broader perspective of mass consciousness agreements, is it really important what we put in our bodies? How can we increase our telepathic abilities? What is the distinction between the higher self and the oversoul? Questioner wants clarification on following the messages of the higher self. Discussion of dream in which Bashar performed a healing on the questioner. For what kinds of things do the Sassani use their voices? Synchronicity and passion are our compass needle, our true self vibrations. Positive & negative : the direct symbol analogy to the concept of positive and negative. Bashar explains how the 4 basic laws can be translated as states of being. What does the word "perceive" actually mean? How can we continue to release the underlying interpretations and beliefs? How can we overcome such consensus reality ideas as gravity? Feeling ill at ease. Comment about being in China during the big earthquake, but not being where the trouble was due to incompatible vibration with the disaster. Comment on vibration and resonance by immersing oneself in sound. Music by Kim Riccelli on the Hang. An extensive exploration of which stars in our galaxy have life? DVD Recommended due to Extensive Visuals.